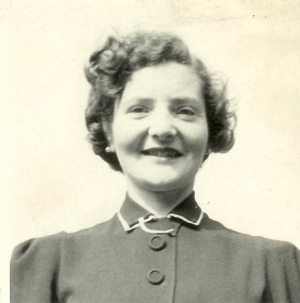 Margaret was educated at James Gillespies’s School in Edinburgh and started work at the Blackwood Press, but soon obtained a a job with the B.B.C. also in Edinburgh. She was personal secretary to one of the famous acting family of the Gielguds at one time, and was later transferred to Glasgow, where she worked during the Second World War. She was in the Schools Broadcasting Department. She met Graham Wallace about this time. 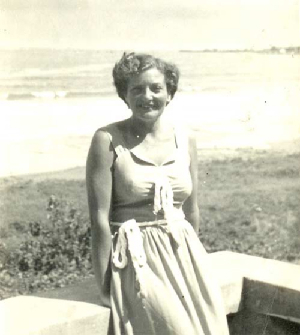 She met Douglas Strachan, a chartered accountant of Nairobi and became engaged in quite a short time. She met him through one of her friends, possibly at Barnton Tennis Club of which she was a keen member. Douglas had a private pilot’s licence, and flew out to Kenya in the course of his work. At the outbreak of War he joined the R.A.F. hoping to get back to the U.K. He and his crew took off one day and were never heard of again. After the war, Margaret went out to Kenya, as Douglas had left her everything he had. She could only get a passage if she had a job to go to, and the B.B.C. arranged that for her. However, she did not like the job, and moved to one with the Kenya – Uganda Railway Company, which enabled her to get down to the coast fairly often at a reduced rate. Margaret stayed in Kenya for about eight years, and on her last leave home she again met Graham Wallace, who was now a widower with one son (Peter). They became engaged, and Margaret returned to Kenya to give her notice. Margaret and Graham were married on 4th June 1954, in Edinburgh. Graham was with a subsidiary of the Commercial Union Assurance Co., and had appointmemts in Glasgow, Cambridge and Edinburgh. Graham was educated at Stewart’s College in Edinburgh, and had a great love of rugby football, finally acting as a steward at Murrayfield for rugby international games.